Vivek Shraya, Trauma Clown, 2019. Press photo. Vivek Shraya, Childhood Clown, 2019. Digital print, 36 x 54". Vivek Shraya, Coming Out Clown, 2019. Digital print, 36 x 54". 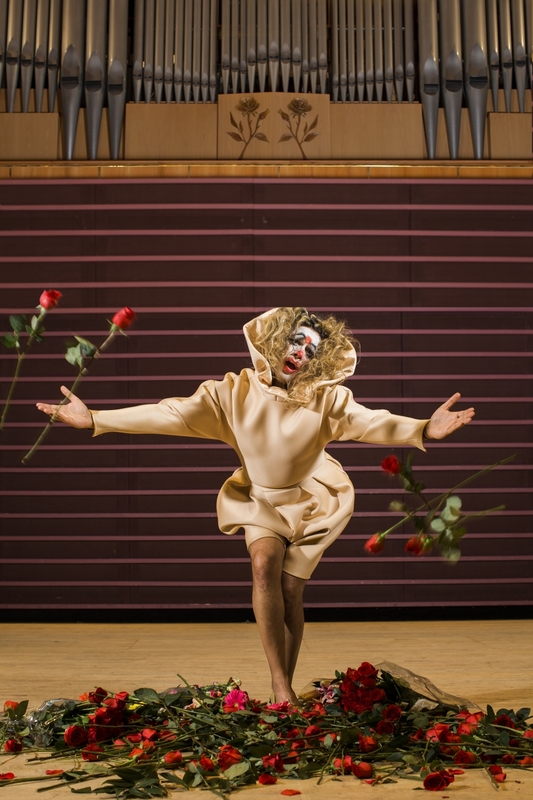 Vivek Shraya, Immigrant Clown, 2019. Digital print, 36 x 54". Trauma Clown is a new photographic series by Vivek Shraya (with collaborator Zachary Ayotte) that traces the correlation between the amount of suffering a marginalized artist shares in their work and the increase in their commodification. Using herself as subject, Shraya reveals how artists who experience oppression must repeatedly revisit traumatic experiences for marketable entertainment—and the material and psychic effects that being a “trauma clown” has on the artist, the art, and audiences. Shraya is a multidisciplinary artist based in Calgary, Alberta. She is the author of the best-selling book I’m Afraid of Men, and was nominated for the Polaris Music Prize for her album with Queer Songbook Orchestra, Part-Time Woman. Her previous photo series, Trisha, received international media coverage, including in Vanity Fair, and has been exhibited across North America. Ayotte is an Alberta-based photographic artist who has participated in select solo and group exhibitions in Canada and Europe. He recently collaborated with sound artists Nulle Part to create a site-specific installation at the Art Gallery of Alberta.